Lifelong dietary restriction has been shown to increase mean and maximum life span and to delay the onset of pathophysiologic changes associated with aging in rodents (Barrows and Kokkonen, 1978). The mechanisms underlying the modulation of aging by dietary restriction remain unknown. Based on studies using several levels of dietary restriction in mice, Weindruch et al. 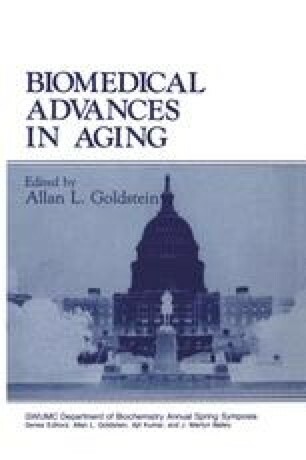 (1986) suggested that increased metabolic efficiency may be related to longevity, since the longest-lived mice at each level of dietary restriction studies also were the heaviest. Although a number of studies support the hypothesis that increased body weight is associated with increased longevity in dietarily restricted rodents, (reviewed by Ingram and Reynolds, 1987), the relationship between body weight and life span is complex, and it is difficult to make generalized statements relating longevity to body weight.